Nochella, Couchella, whatever you want to call it: This is your chance to join in on the Coachella 2019 fun without having to leave the comfort of your home. This year, the festival will debut its Coachella Curated content during weekend two of the event for a deeper look into the music and culture of Coachella artists, including encore performances and original content from the festival. 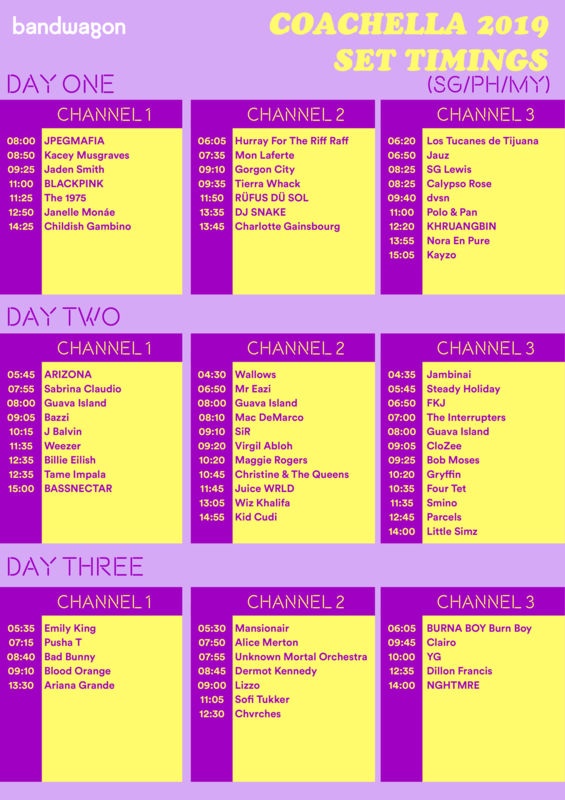 For our Southeast Asian readers, we've taken the liberty to convert the timings listed on Coachella's YouTube streaming page, where select sets will be broadcasted — all for our viewing pleasure. If you live in Singapore, Malaysia, Indonesia, Thailand and the Philippines, take note of these timings so you can wake up on time to catch your favourite acts. Check out our guide to the Coachella 2019 live-stream set times below. Live streams for Coachella 2018 will take place from the mornings of 12 to 14 April (13 to 15 April for SG/PH/ID/MY time zones) via Coachella's YouTube channel.